A few nights ago, I dreamt I was fence judging. Unfortunately, the jumps were in a series of intersecting corridors so there was nowhere to stand that wasn’t in the line of another jump. Begin psychological evaluation. The cross-country aspect was new but I frequently have dreams of courses inside houses & of unjumpable fences, for example, a vertical headed into a wall. I don’t get around to dream-jumping these. Usually I’m walking the course I trying to figure them out. The frustration aspect I get, but inside a room? My hyper-literal mind interpreting my desire to ride in the Fall “indoor” shows? In my dreams I rarely ride. I’m much more likely to be getting ready for a dressage test, only to have the bell ring while I am still tacking up. Bog standard anxiety dream. In contrast, when I dream about firefighting, I am kickass. I rescue entire buildings with a hose I happen to be carrying in my pocket. Ironic because in real-life I’m a less than stellar firefighter [Ticket]. Of course, the anxiety dreams outweigh the awesome-sauce ones. Why can’t we dream that we are flying Air Force One? Or riding in an Olympic victory gallop? Or living on the moon? 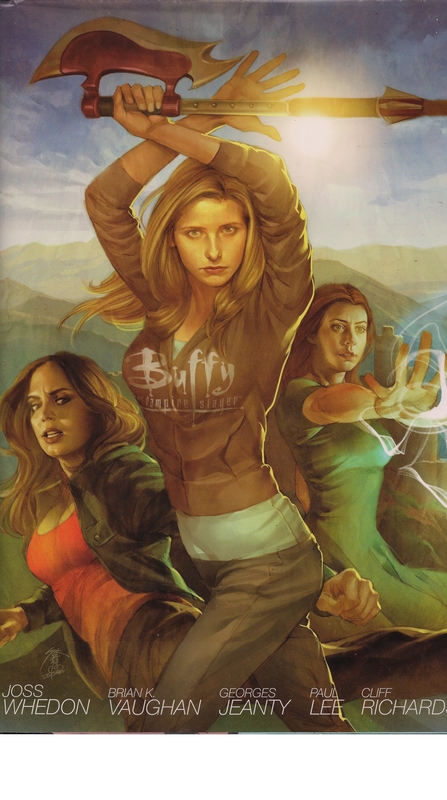 In “The Long Way Home” from Buffy The Vampire Slayer, Season 8, Vol 1 by Whedon & Vaughan et al. [Dark Horse Comics 2010], the character Ethan Rayne says, “You are always dreaming every dream you could dream all the time. Even when you’re awake, a part of your brain is stirring that brew. Which one you choose to remember in the morning is based on wishes, anxieties…”. As good an explanation as any. 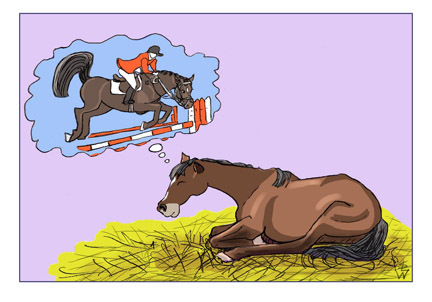 Do you think horses (cats, dogs, iguanas) dream? i’m sure animals dream. ever watch a dog who’s deeply asleep? my collie used to dream of belly rubs and chasing rabbits. you could tell by her body posture and facial expressions. but she used to get nightmares, too, and i’d have to call her name – sometimes more than once – before i got thru to her and she’d shake and settle down to sleep again.